Big show last night at 02 World Arena in Hamburg with a WBA, and Interim WBC and a European title at stake along with appearances by two former world champions on the comeback trail. 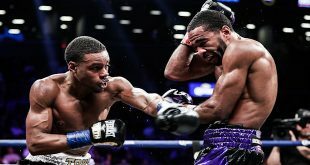 WBA super middle titlist Dimitri Sartison, 27-1 (17), made his first defense a good one, handling the challenge of two-time ex-middleweight title challenger Khoren Gevor, 31-5 (16). 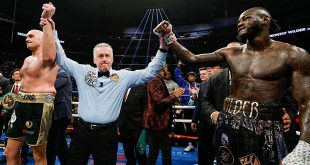 Southpaw Gevor came forward the entire fight but was picked off repeatedly by the bigger Sartison until the challenger managed to finally close distance in the final frames and batter Sartison around the ring. But it wasn't enough as Sartison won a 117-109, 117-110 and 115-112 unanimous decision. WBC Interim middleweight ruler Sebastian Zbik, 30-0 (10), had his hands full with Argentine challenger Jorge Sebastian Heiland, 16-1 (8), over the course of their twelve round bout. Heiland came to fight and was aggressive, throwing Zbik off his game plan for many of the rounds and forcing the German to rely on his greater experience to stay in the contest, picking his spots with some success. 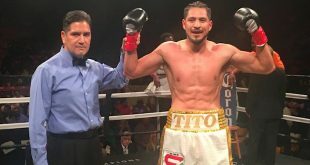 The South American southpaw, who had never previously gone past ten rounds, finished the contest strongly but was handed a loss via a 117-111, 117-111 and 116-111 UD. Heavyweight Alexander Dimitrenko, 30-1 (20), returned from last year's WBO title eliminator loss to Eddie Chambers to halt Yaroslav Zavorotnyy, 14-5 (12), in the fifth to annex the vacant European crown. Ex-WBO super middle champ Karoly Balzsay, 22-2 (16), knocked out Azziz Daari, 24-15-4 (20), in the fifth and former WBC cruiserweight titlist Juan Carlos Gomez, 48-2 (36), won on points over eight against Zack Page, 21-30-2 (7).